I used AVR tiny13 for small applications very often, and mostly it is powered by only small battery. It is easy to put the AVR MCU to power save mode with avrlib, just few lines of code would do. To wake up the AVR MCU, you should setup interrupt before falling into sleep mode, either pin change interrupt or external INT0. //do nothing in interrupt func. I only measured once I finished the demo circuit, and it should use around 10 times less power when AVR is in sleep mode. Have fun. When we design lighting circuit, we would like to light up the LEDs only when there is somebody around. 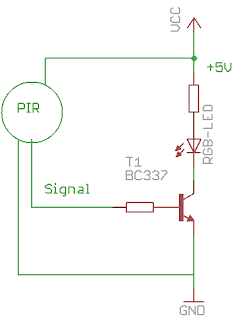 The PIR sensor is a motion sensor based on passive infrared sensor which senses infrared emitted by human body. I got the PIR Module "KC7783R" from local store, which includes the PIR sesnor and also the KC7783 motion detection IC. The PIR module is very easy to use, it contains only 3 pins (1-Signal, 2-Vcc, 3-Gnd), where it detects somebody moving, the signal line goes high for a period of time (3 secs for example). 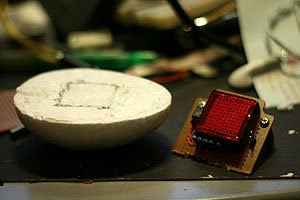 My another demo of using PIR module, combining the use of AVRtiny13 as a timer. 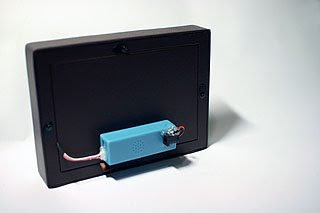 When it detects motion, it will light up the light bulb for 10 seconds, afterward it will go into deep sleep to save power and wait for the next interrupt send by PIR module. We love simplicity, Evil Mad Scientist Labs proposed a simple and Cheap Dark-detecting LED circuit, only few components can work it out! PAL TV game only need one ATmega! It is an open source project called "AVGA", which uses only a single AVR ATMega168 to create a super mario clone. Schematics and firmwares are provided freely! 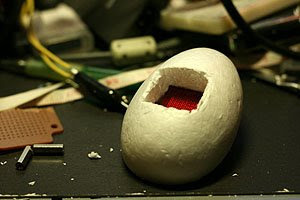 After I completed the LED egg prototype with Atmel AVRtiny13 and a 10x10 LED matrix, I passed the LED egg to kaas, she worked very hard to decorate the LED egg case. 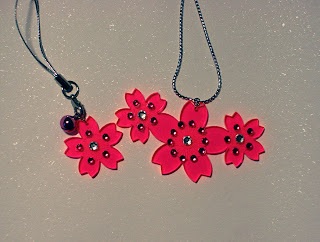 It is very pretty now and I am happy to show you here. 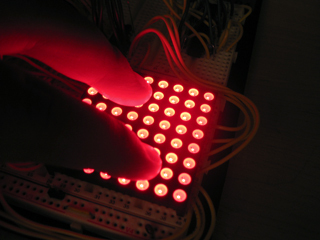 Recently, I found someone use the same idea to implement a LED input sensing demo with ATmega8, it is very interesting. 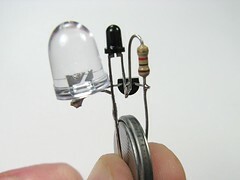 AVR tiny13 with limited IO, small and powerful, so it is really good to make a DIY LED candle. AVR tiny powered by Lemon!! Tiny13V is aimed for running on low power condition! How low is it? It can be powered by the natural battery "Lemon". Procyon AVRLib - C-language Function Libary by Pascal Stang. Pascal Stang is really nice to make the AVRlib freely available for AVR developers. (he is also the author of ARMLib). The AVR Lib contains codes for nearly all the function that AVR chip provide, eg. UART, I2C, SPI, PWM etc. Also it includes some high level functions like IDE/CF, GPS, LCD modules. I didn't try it, but I am going to use it for the next project. Stay tuned. Research on accessing SD card with AVR. Using AVR as a data logging system is cool, but data storage is a great problem as external eeprom or flash memory may be too small and expensive. I guess most of us have some 16MB and smaller SD card on your desk because nowadays you are using 2G SD cards on your camera! 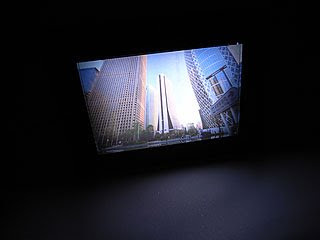 4D Systems makes some really nice serial OLEDS. They aren't hard to use, but the documentation for them is very scattered. This tutorial pulls together the various pieces i've found so that you can get up and running very quickly. 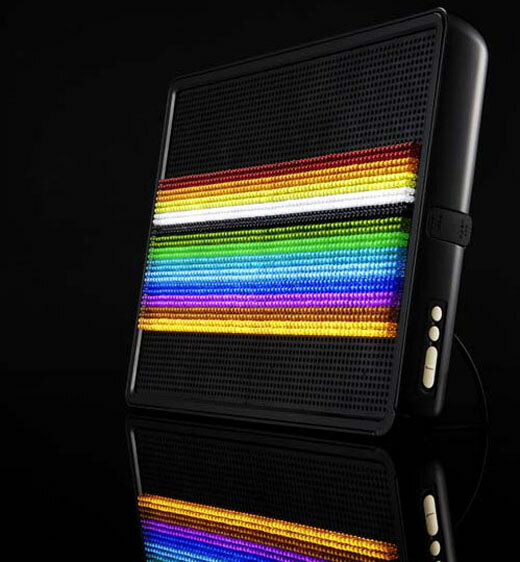 Lumindot is a new kind of toy for children produced by Bandai, it is a Backlit frame with 70x50 holes on it, so you can put the colorful pins in the hole. It is a very cool way to do pixel arts, it looks like a 70x50 Led matrix if you know about electronics. 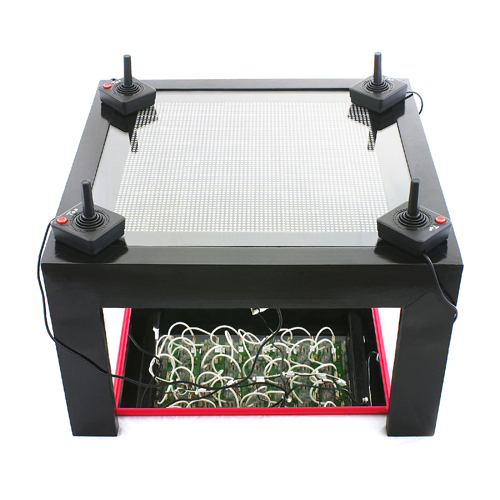 LED coffee table by SparkFun! They really worked very hard on this cool LED table! 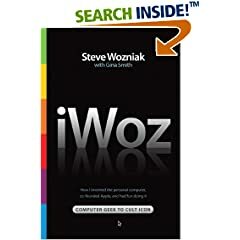 Recently, I am addicted to this book "iWoz" by Steve Wozniak, who is the co-founder of Apple. He shares the experiences, thought of making all the cool products and inventions in an engineer perspective or he claims that is an artist view. He can also help you understand how the first home computer was born: the Apple I & II. He is really a fun person and passionate about technology and who really want to use technology to improve people's life. 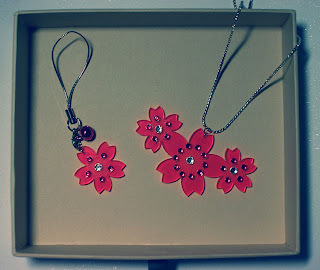 I have made one cell phone strip and one necklace by using the laser-cut service provided by Ponoko. 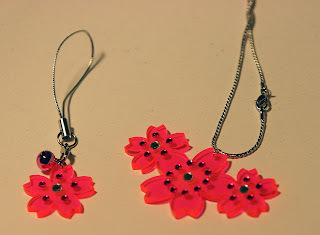 You prepare a vector graphic design and choose what materials (plastic or wood) to cut out your masterpieces in Ponoko. It is pretty good though the shipping cost is really too much for me. Anyway, I worked it out. I think it may be a good idea to make your robot parts or your electronic project enclosure next time with this online laser cut service. It is my favourite Kit so far, it is very handy and easy to use. 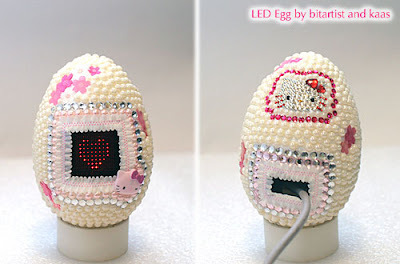 It is an AVR LED game console kit made in japan. It uses ATmega160 and four 74HS595 chips to extend output pins for controlling a 16x16 dot matrix led panel. It also comes with a speaker and joystick to help you start making a cool gaming console! 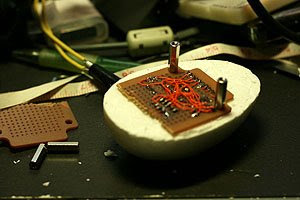 No fancy accelerometers, no complicated algorithm and circuits. Only a motor and a simple touch sensor, it is really cool to see such small and neat robot. Just came across a AVRtv channel on youtube, it is the ATMEL AVR marketing channel for promoting new microcontrollers, recently playing XMEGA, and also the new UC3 series. Olivier worked with his son to make this lovely project. 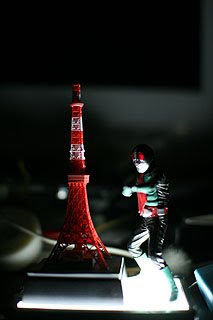 He also wrote a VB application to generate the LED pattern to ease of the works of his son. In his site, circuit diagram is also included, it is definely a lite project for fun. 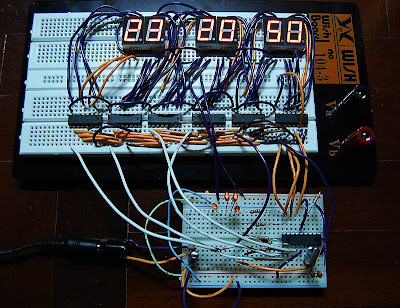 I always want to build a nixie clock, but it is difficult to find the nixie tube and also the tube driver ICs. The kit available on the internet is still expensive for me. 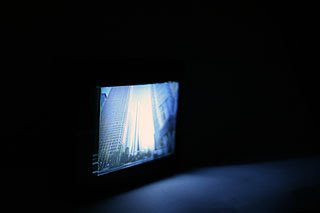 Here is a cool video of nixie tube filling with blue led, it becomes more attractive! A new post from ublog, displaying the inside of 8-bit AVR MCU. There are two OC0A and OC0B compare outputs in Tiny13. It is useful to generate waveform . 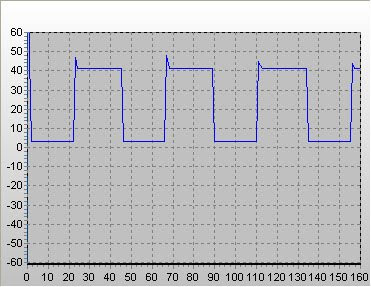 In this example, we use OC0A to output a square wave to blink the LED which is very similar to the previous timer interrupt example instead the output is generate inside Tiny13 but not our interrupt routine. Tiny 13 have an external interrupt "INT0" on PB1, We have created a test project on avr-gcc to have a quick testing on the INT0. B1 is connected to a switch, and B0 is connected to a LED. When B1 is pressed, it would toggle the LED On or Off. Anyway, it is good for lighting. I got the EL panel in a local store which should be powder phosphor-based electroluminescent panel. 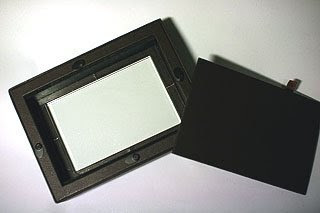 It is a 3.5" x 4.6" white light panel. 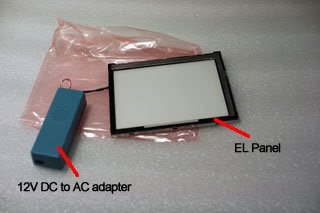 It included an adapter for converting 12VDC to AC for the EL panel. Let's see how we can make use of this EL lamp. 2. 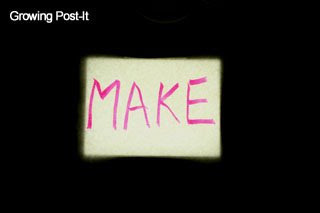 Put a Post-It on it, and you can see a growing Post-It in the dark. 3. 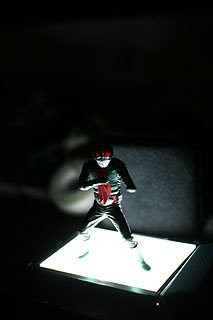 For home lighting, illuminate your Toys. 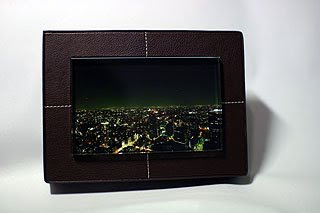 Glue the panel in the back cover of the photo frame. 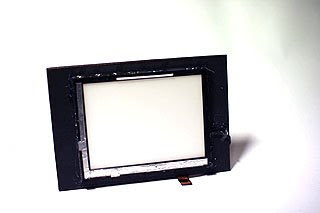 You can see there is about 1.5 inch space between the photo glass panel and the back cover. We like to have some distances apart the EL panel and the glass to diffuse the strong illumination of the EL. It looks alot better on my desk, sorry for my poor photo skill. 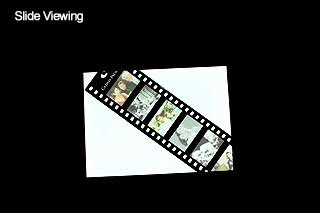 Let's see the photo frame in action in the below youtube video. Enjoy It. It is very cool, the robot plays the instruments with servo motors until it matches the surrounding music/tone. It needs sometime to make it right, still it is an amazing project. 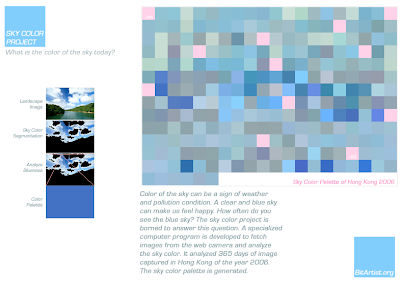 Sky Color Project - What is the color of the sky today? 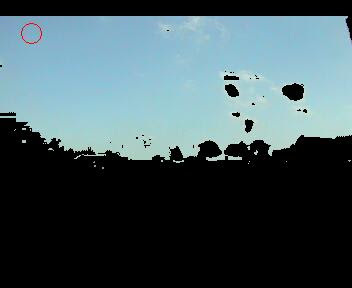 There are few web cameras installed to monitor the weather or traffic conditions online, so what else information can we get from these images? One important thing to us is the color of the sky. It is a sign of weather and also the pollution condition. So this small project comes up. 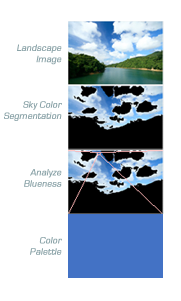 we developed a program to analyze the color of the images and look for the best blue. 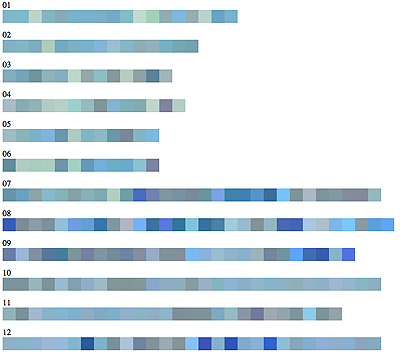 The color segmentation is the most difficult part, the blueness is hard to define. 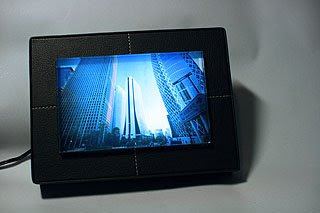 Luckily, we can easily find many digital images nowadays in flickr or other online gallery system. We used the images to train our color segmentation engine and also with some human fine tunings. We got 365 images from the Hong Kong Observatory (Yes, we live in HK) in the year 2006. The sky with no blue-like color is ignored in step 4, it happened in cloudy or rainy or dusty day and so you will see a gray or white cloudy sky, i.e. no color captured. 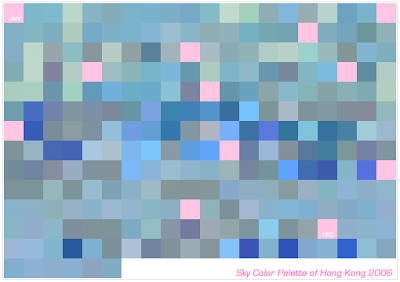 In a statistical view, we make a sky color bar chart for each month. What we can get in this chart? 1) Second half of the year, we get a clearer sky. 2) In August, we have more blue sky days.